Originally published under the title "The Shocking Truth About How Obama's 'Rigorous Vetting Process' For Syrian Refugees Actually Works." Honesty boxes from around the world. As the US Congress looks into the refugee vetting process, news that two more "refugees" from Iraq have been arrested for plotting attacks in Texas and California casts further doubt on our ability to detect Jihadists among the masses seeking entrance to the USA. Obama administration officials often talk about the "rigorous and robust vetting process" for those fleeing ISIS-controlled territory, but the process is neither rigorous nor robust. It more closely resembles what in rural communities is called the honesty box. Though the honesty box has disappeared from all but the most rural American communities, the tradition lives on in Britain where parking lots, vegetable stands and even bookstalls sell goods and render services to the public without attendants — all on the honor system. Drop your money in the metal box and buy a dozen eggs, park for an hour, even cross over a river on a bridge that runs through private property. Like the estate owner in Chipping Norton who trusts visitors to pay for parking while touring his ancestral home, so too the US government trusts that those applying for admission to the USA will simply declare their dubious affiliations and proclivities upon request. The US government trusts that those applying for admission to the USA will simply declare their dubious affiliations. So why do Obama officials keep on insisting that they are engaged in "a very rigorous, robust vetting process?" The phrase (likely originating in the wit of Ben Rhodes, Obama's Deputy National Security Advisor) has become an Obama administration mainstay. But their system is no more rigorous than an honesty box. Call it honesty box vetting. In spite of these claims, it's clear that there is no real plan. State Dept. spokeswoman Elizabeth Kennedy Trudeau side-steps the fact that there are no regular procedures to follow by asserting that "every visa case is unique and the interview questions are tailored to the circumstances of each applicant." Rhodes too assures reporters that we have "broad access to terrorism databases." Former Congressman Pete Hoekstra, however, is not buying it. "The guy's lying," Hoekstra says of Rhodes. "If we can't vet the people there...who we're giving weapons to, how do we think that we're going to be able to vet the people coming out of that region and that we're going to know who they are, what they've done in the last five years during the civil war?" As Rhodes said repeatedly at a White House press briefing on November 19, "it takes up to 18 to 24 months for a refugee to be admitted into the United States after the exhaustive screening." However, most of the initial "face-to-face interviewers" are not US officials but rather employees of either the UN or a variety of other "resettlement agencies" contracted by the State Department. And they too seem to rely on honesty box vetting. Unlike the State Department, the United Nations High Commission for Refugees (UNHCR) actually has a set of consistent procedures. According to an IPT White Paper, the UNHCR's Handbook "instructs interviewers to give refugees 'the benefit of the doubt.'" So when an applicant whose name does not appear on any of the alleged terrorist databases is asked if he has connections with ISIS, his "no" answer is deemed credible, and the UN vetting ends. The State Department doesn't look into applicants' social media presence before granting visas. This should be particularly alarming amid the discovery of ISIS documents instructing jihadists to pretend that they are Christians. Recent disclosures tell us that the State Department doesn't even look into applicants' social network presence before granting visas. DHS Chief Jeh Johnson says that doing so would violate their privacy. Instead of hiring hundreds of additional background checkers at the BATFE and thousands of accountants at the IRS, maybe the federal government should hire hundreds of social media analysts and thousands of computer security specialists to scour the Internet for clues that Johnson doesn't want to look for. 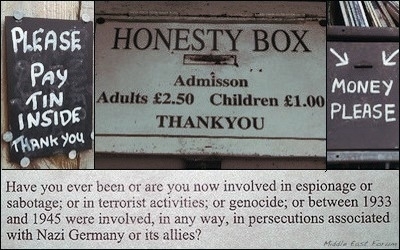 The honesty box depends on honesty. It shouldn't take a jaded misanthrope to realize that this is a bad system for implementing national security.